We went on an excursion to the Rain Centre in Chennai. Shekar Uncle taught us about how water in Chennai comes from the Poondi, Chembarambakkam, Cholavaram and Red Hills lakes. He told us that Chennai gets a lot of rain each year. But we waste a lot of the water. So, this year, we may even have a drought in Chennai. Uncle said we could “harvest” the water. 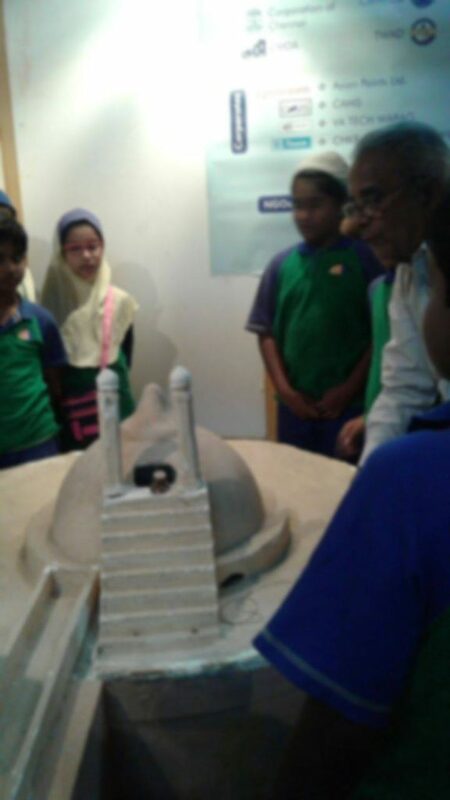 Then Shekar Uncle showed us a model of a building which harvests and re-uses water. 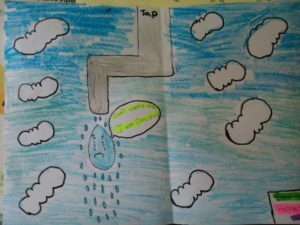 When he put on a switch, the water in the pipes started flowing. It was really cool. When we came back, Salman, Muhammad and a bunch of others started digging a recharge well outside. They were so moved by the need to harvest water. 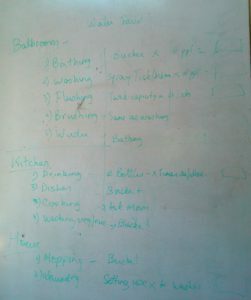 Today in class we discussed where all we have seen water — in the toilet, the kitchen, on the road, in the sea. 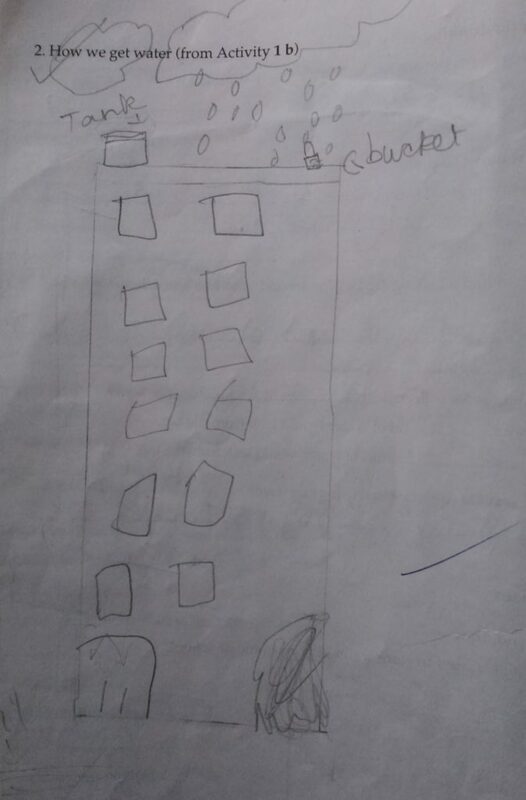 Aunty also asked us to write down how rain water comes to our house so we can drink it. Most of us on the ECR get water from underground. We have borewells with motors in our houses which we use to fill up the tank upstairs. 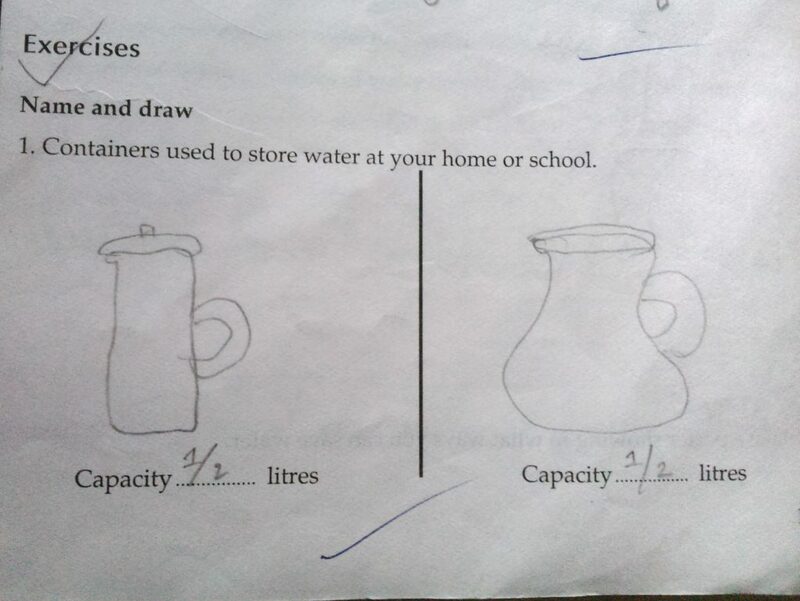 Abdullah said he keeps a bucket on the roof so it could fill up and he could use the water for drinking. But Aunty asked, “Can we do this every day to collect all the water we need in our house?” Not really. Someone else said that they get a lorry of water at their home. We discussed how we have seen buckets placed up in a straight line next to hand pumps on the road. And how tankers bring us water from far away wells and people fill water from them every day. Many large housing complexes in Chennai get all their water from tankers which bring water from surrounding villages. 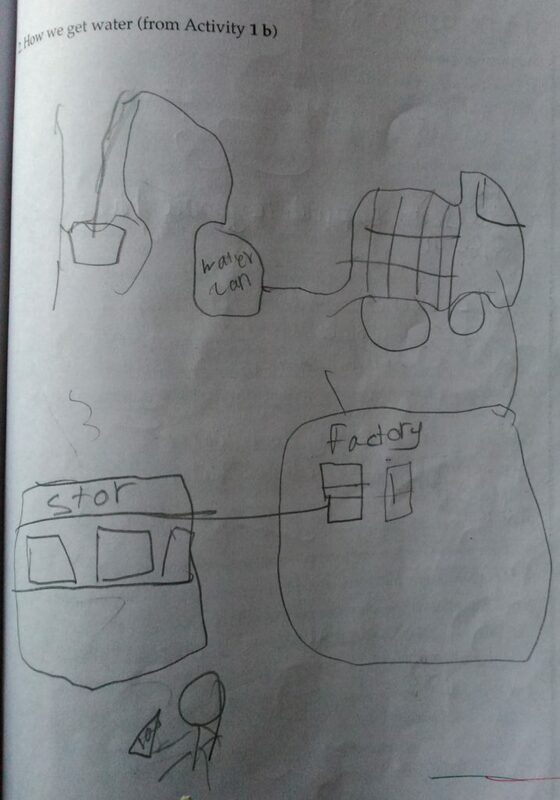 We had to write and draw this in our workbooks. As homework, we had to interview our parents about how their toileting habits when they were young were the same or different from ours today. Most of us and our parents used a bathroom at home; Rayya’s father bathed in a common tank while growing up. When it came to brushing teeth, all of us children use toothpaste and brush. But our parents used miswak sticks, their fingers or tooth powder. Most parents and children use(d) soap and shampoo, but some kids said their parent had used besan and shikakai. We all have washing machines at home and use detergent to wash our clothes. But most of our parents didn’t have these. They washed their clothes using a bar soap, sometimes at the well and sometimes inside. Our water sources are inside the house, actually on top of it. But some of our parents had wells in their homes — sometimes a common well also. Most parents and children use indoor toilets. We mostly use western style toilets, but our parents had Indian style toilets. Some had dry latrines. For the toilet, we could put up a paper outside the bathroom. Every time somebody in the family flushes the toilet, they should put a tally mark. 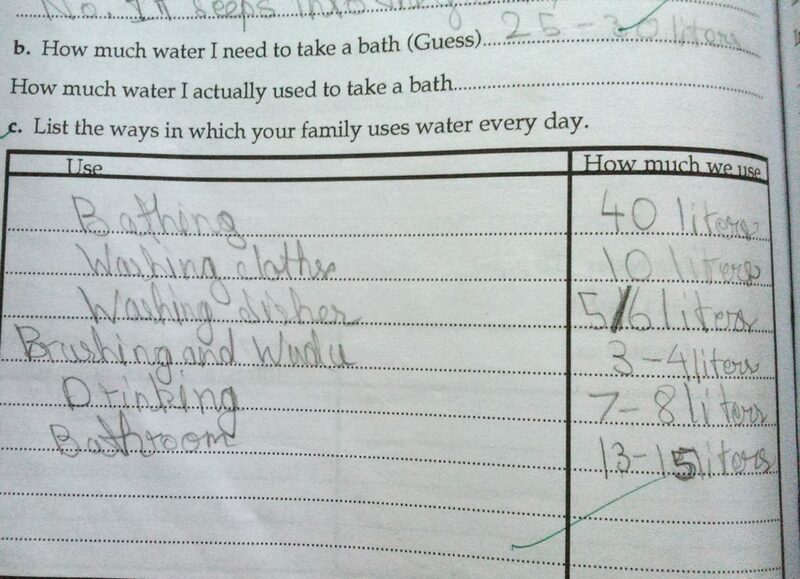 We could put a large tub under the kitchen tap to see how much water is used in washing dishes. Someone said we could stand in a tub-bucket while bathing. All the bath water would fall into that tub and we could measure it using our 1 litre container. Washing ourselves after passing urine or stool presented a problem — a lot of us have hand-held showers in the bathroom for that. Aunty suggested we could mentally time the water flow while washing — using the “Tick Tick” method. Then measure it again afterwards by pouring water from the hand-held shower for the same amount of time into a mug, then measuring it. For washing clothes, Aunty said that most machines state how much water they use in a cycle. We could track how many washing cycles were done in a day. For cooking, we could ask our mother to use measuring jars for a day. For mopping, we could measure how much water is used in the mop bucket and then multiply it by the number of times it is changed. As we were nearing the end of the school year, Aunty suggested we do this activity next year. Today we compared the water from a pond and tap water. The pond water was brown and dirty. It smelled horrible. When the water bottle was left untouched for some time, the dirt came to the bottom. When we filtered this pond water, some green stuff remained behind. Then Aunty brought some liquid soap and we added it to a sample of the pond water and stirred it using ice cream sticks. There was no foam. 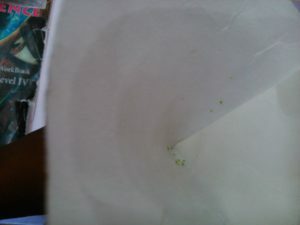 Finally, we added a bit of this water to a petri dish, covered it and left it. The tap water was clear and white (sic) in colour. It smelled natural. Nothing settled to the bottom when we left it standing for some time. When we added a few drops of liquid soap, there was a lot of lather. We took a few drops from this water too and left it in a petri dish to evaporate. The next day we saw that all the water had evaporated in both dishes. There was a small bit of dust left in the pond water dish, but nothing in the tap water dish. We also made a mixture of mud and water. Aunty told us to leave the beaker undisturbed for some time. The water changed colour to a lighter brown after some time. Aunty gently poured some of this water out to show us decantation. We had a discussion afterwards — we could use this water for plants, but we wouldn’t drink it. We had a discussion on how water should be filtered before drinking. Most of us get water cans from the store. Or we have RO systems. We don’t drink water from the tap directly. When our parents were young they got clean water from taps or near their house. We talked about saving water. Aunty had asked us to check for leaky taps at home. Some of us found leaks — and collected 2-10 ml of water in 10 minutes. Some didn’t measure. Aahil said his family called the plumber to come fix the taps. Mariam said she put a jug under the tap and collected the water to wash her face and brush her teeth. Aunty told us that the upstairs bathroom has water leaking from the water spray. We discussed how we should put the tap off while brushing teeth. Aunty told us about a science fair project done some years ago where a student compared the amount of water utilized for wudu (ritual ablution before prayer) with a mug and under a running tap. There was a lot of water wasted when wudu was done under a tap with flowing water. We brought newspaper articles which talked about the water shortage in Chennai. They are expecting a drought this year as it hasn’t rained much since November 2015. 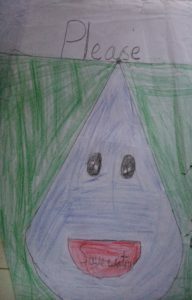 We’ve made posters to encourage people to stop wasting water. 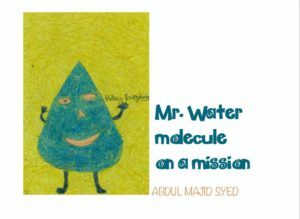 Majid wrote a book on the story of a water molecule. 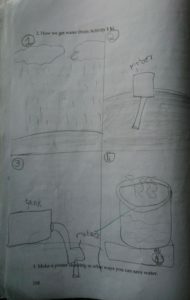 Hasna made a model of a rainwater harvesting building which demonstrated how water flows into recharge wells. This was her project on Open Day. This chapter got covered in a hurried and distracted manner — the school had a lot of other events going on at the same time with which I was personally busy. Hence the children had to do a lot of the activities and thinking by themselves. Surprisingly, or perhaps, not surprisingly, they did an excellent job given these circumstances. While the specific output for an activity may not have been exactly as laid out, they went ahead and did things to the best of their ability. The children had been taken to the Rain Centre to learn about rainwater harvesting. Here they learned about the process of rainwater flowing into catchment areas from where it goes to different areas after purification. They tried to incorporate this learning in their responses in the workbook — but in a much simplified way. The children’s illustrations were better — most could depict the process by which they thought water came to their houses. In their minds, there is this thing called a “Water Company”. Rain falls near the company, which collects the water, packs it and delivers to the houses. 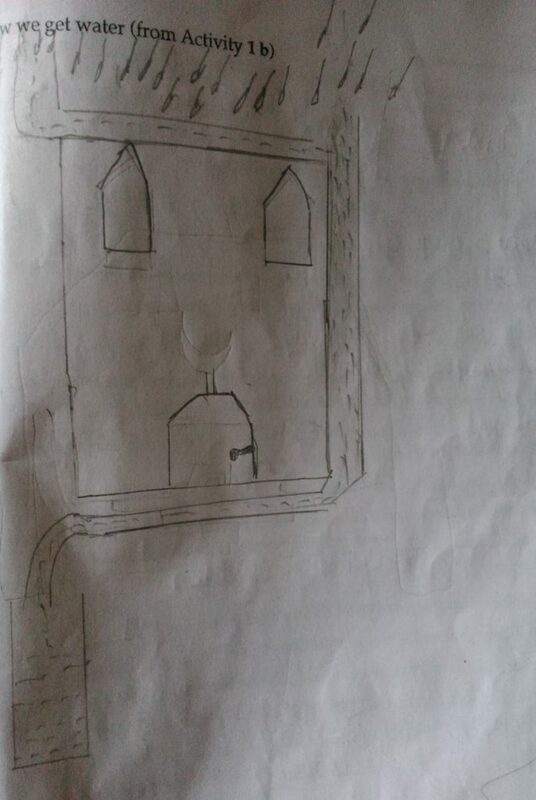 Some children drew how water fell on their houses, went underground and they use the motor to pull it up. Children didn’t connect the recharge wells and underground flows which they had heard about at the Rain Centre. And didn’t see the contradiction between not having any major rainfall in Chennai for the past 1 year and that they’re still pulling water from underground. These drawings are a window into their understandings and interpretations. We couldn’t do much justice to how crops are watered. These are urban children, and possibly encountering such a question for the first time. Some had bizarre responses like “buckets should be filled and brought to the field.” It showed how completely out of touch urban children can be from agriculture. Possibly their “ur” or “native place” was not agricultural either. Nonetheless, I asked them to talk to their parents/teachers, etc. to see if they could find out how crops are watered. Most families have deep roots in their villages, so parents were likely to have some answers. 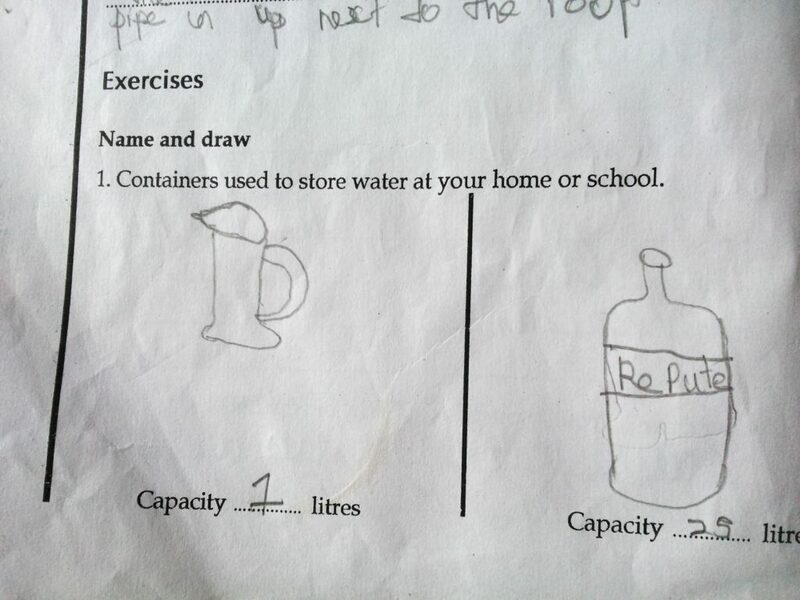 Where this was the case, we got responses like “electric pump set”, “sprinkle irrigation”, etc. Kids did know that millets (which are quite the rage in Tamil Nadu) require less water. Some children left these questions blank. I gave the task of finding different containers to check their volume as homework. While they could find different containers, with a few exceptions, they weren’t very successful in making their own 1 litre container. 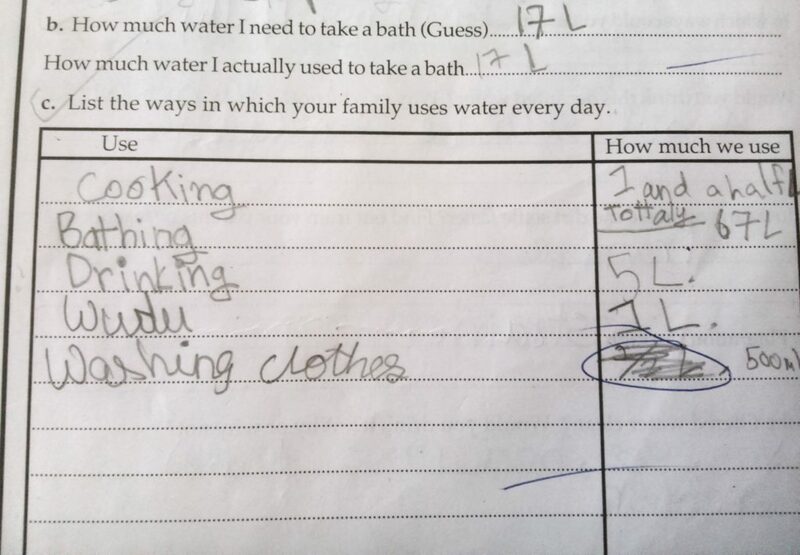 Similarly, while children could list the different ways that their family used water, their estimates of actual usage were wildly off — indicating that they probably didn’t actually measure the usage. Students’ responses to whether they would drink filtered water had an interesting contradiction. When offered that water in class, they flatly refused it. However, in the workbook some said they would drink it because “the colour was clean”, “it has been filtered”, “yes, because I used a strainer”. Only a few said they wouldn’t drink it because it still had germs in it. It seems that, despite all our efforts, children may sometimes treat their written responses to be from a world different from their real world. 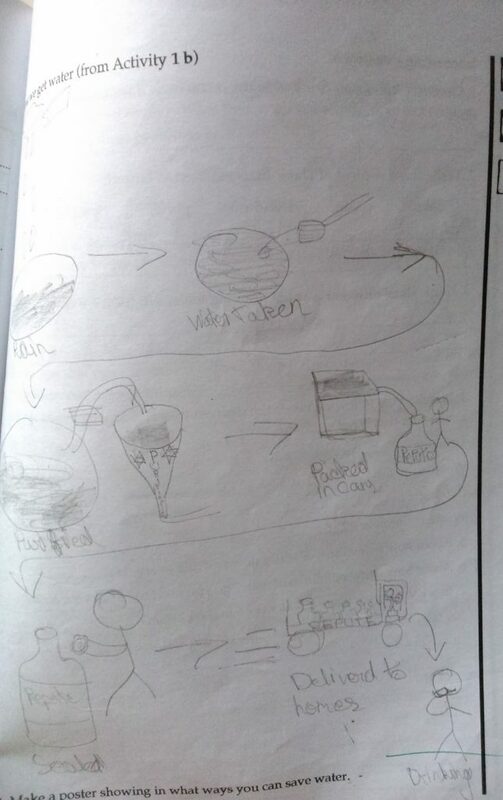 In their response to which diseases one can get through microbes in water — most children said diarrhoea, loose motion. However, some added cold and cough — there is a local traditional antipathy against cold water since it is believed to cause colds. I wonder if the same belief got extended to all water. One child even wrote “cancer”. The Find-a-leaky-tap activity — children found leaky taps at home and tried to shut them tightly. 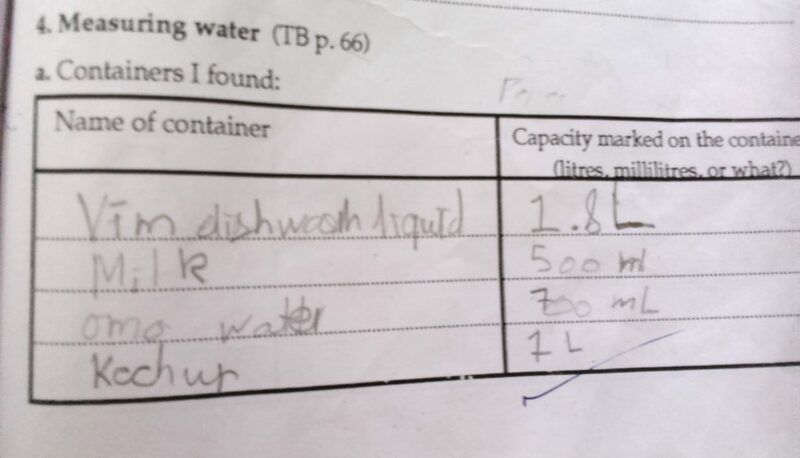 When it came to measuring how much water leaked in 10 minutes and using that number to calculate the amount for an hour and a day — the numbers were wildly off — reflecting that children may not connect the maths skills they’ve learned in the Maths class with doing Maths in the Science class — again, a problem of silo wise subject teaching. In the section on Classroom Discussion — where to questions like “Do you get clean drinking water?”, “Do you have to carry water?”, etc. — their responses reflected their life — which is urban and upper middle class. Most children reported they get clean drinking water. Some said clean water was expensive, they had to pay money for it. Solutions to the problem of clean water ranged from “they (sic) need to take responsibility” (not sure who the “they” is), to “clean the filter properly” to “rainwater harvesting”. Their sense of having to carry water (“Do you have to carry water? Why?”) was about carrying water around the house — “Yes, so we can drink it.” A few students mentioned how a parent needed to carry buckets of water during the floods, when the power failed and the overhead tanks couldn’t be filled. 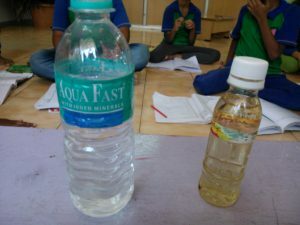 Most children reported that their water purifier decanted and filtered the water. Most children could answer how sea water would evaporate. Some said you could boil the sea water, another said the water is kept in a large place where it is sunny and it will evaporate. Another child said you would have to use a “huge strainer”. He didn’t connect the experiment we had done earlier where we evaporated salt water to get salt. Most children could comfortably read the bar chart and answer the questions — demonstrating that they have developed this skill during the year. 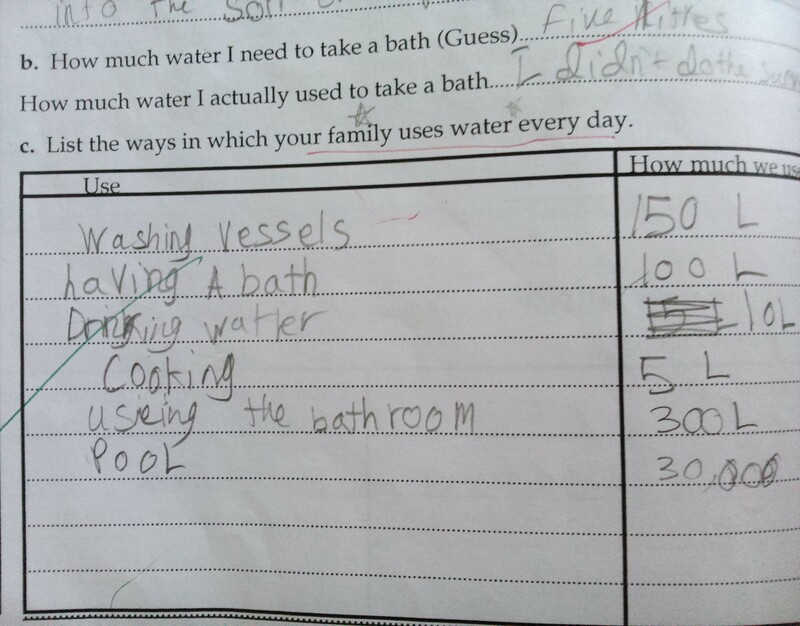 A key learning for me was that homework which involves actual measurements doesn’t work well when left to the children. Next year I might call the parents in for a special session and explain the exercise to them too, so they can support the children in recording accurately.